Twitter monthly active users: 200 million and growing fast. 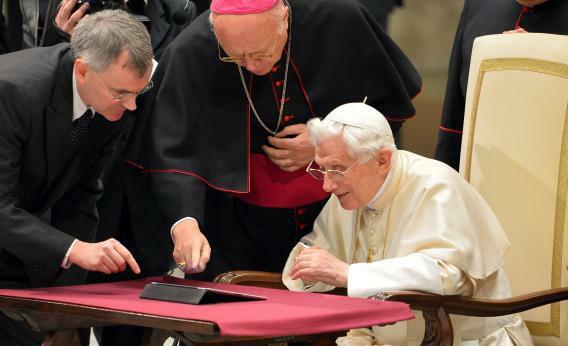 Pope Benedict XVI is among Twitter’s 60 million new active users since March. Whether because of its name, its outsize media hype, or its reputation for getting its users in trouble for ill-advised words, Twitter has struggled to be taken seriously by adult Americans outside the media and celebrity spheres. But while faddish firms like Groupon and Zynga have fallen by the wayside, new figures make it clear that the six-year-old microblogging site has lived up to its billing as the biggest thing to hit the Internet since Facebook. Twitter announced today (via tweet, of course) that it has reached 200 million monthly active users worldwide. That makes it either the second or third largest social network in the world, depending on what figures you use for Qzone, a Chinese Facebook substitute. More impressive is the speed at which it has reached that milestone. It was only last fall that Twitter was crowing about reaching the 100-million user mark, meaning that it has doubled in size in the past 15 months. When the company last shared its user tally, in March, it had 140 million monthly actives, so it has been adding active users at a rate of about 7 million a month. That’s not quite as fast as Facebook’s record-shattering growth at the same point in its development, but it’s on the same order of magnitude. Facebook clocked 200 million users in April 2009, at age five, just eight months after hitting the 100-million milestone. What’s remarkable about Facebook is that it has sustained its phenomenal growth in the years since then, scraping 1 billion active users earlier this year. Can Twitter do the same? Purely as a social network, probably not. A lot of people only have the time and patience for one, and Facebook is by far the easier of the two to get into. Plenty of people use Twitter to keep in touch with friends, but it’s not optimized for that like Facebook is. Rather, as I explained earlier this year, Twitter’s growth is largely a function of its pivot to becoming a mainstream media outlet—a news source, a hub for celebrity profiles and gossip, and most of all, an interactive complement to live events like the Olympics and the presidential debates. We can’t know what drove 60 million users to become active for Twitter in the past nine months, but I’d wager those last two events were responsible for quite a few of the U.S.-based sign-ups. Twitter’s prominence as a “second screen” for TV viewers was reinforced this week when Nielsen, the ratings service, announced a deal with the site to create the Nielsen Twitter TV Rating, a metric for the amount of engagement a show is sparking on the social platform. The idea is that advertisers increasingly see Twitter as a key extension of their presence on the tube, and will be more likely to buy time on a show that’s being widely discussed online. There’s one other takeaway from the new Twitter numbers: It’s holding its lead over Google+, which reached 135 million active users earlier this month. When Google entered the social network fray, many thought the tech giant would quickly emerge as the most formidable competitor to Facebook. But instead of relegating the much smaller (and still private) Twitter to niche status, it’s Google+ that remains an afterthought while Facebook and Twitter solidify their respective roles at the top of the heap.